Disaster recovery is an important aspect of business continuity. If disaster strikes and takes down your entire business infrastructure, it could be days, weeks, or even months, before you are fully recovered, depending on the extent of the disaster and its damage. Take a second to think about how your business would continue under the following circumstances. If you have a solid answer, chances are you have a solid disaster recovery plan. If not, it’s time to think about what you would do in each of these scenarios. What happens when a server crashes? Will you move seamlessly to another server, or crash and burn until you can get the server repaired again? What happens when a hard drive fails, or data storage crashes? Will you lose access to that information, and scramble to gather it again, or seamlessly move to a backup version of that data? 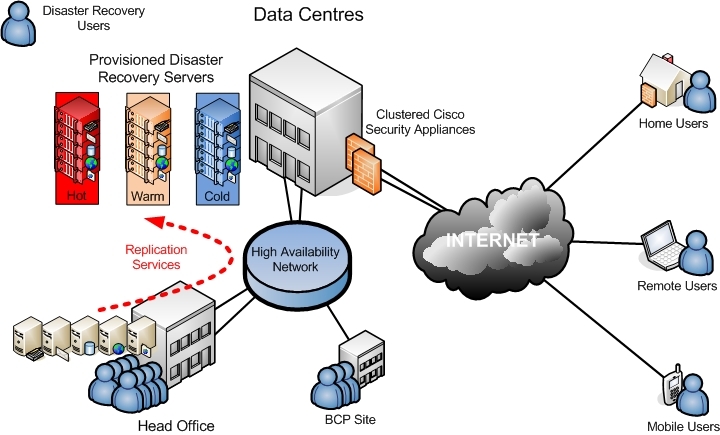 What if natural disaster strikes and your Internet infrastructure slows down? Will you move to a uninterrupted power supply with your mobile data network, or sit and wait until your Internet is back up? What happens if your online security is compromised? Will your customers be able to continue using your services as usual while you sort the problem out? Now, take this one step further and consider what any of these situations would do to your organization. What would your reputation look like? What would the financial loss be? Industry surveys estimate outages cost an average of $5,600 per minute, reaching in excess of $300,000 per hour. These costs are enough to put a small organization out of business. Naturally, from a fiscal standpoint, it makes sense to build disaster recovery into your organization’s budget, and with monthly subscriptions that range from less than $100 to a few hundred dollars for a cloud-based DR solution, it’s more affordable than you may realize. One reason why many small businesses skip over disaster recovery is a lack of understanding of its basic concepts. The concepts of disaster recovery may have a technical nature, but aren’t as complex as one may believe. The recovery time objective, or RTO, is the maximum desired length of time between an unexpected failure or disaster and the resumption of normal operations and service levels. The RTO defines the length of time that is allowed to pass between system failure and repair before the consequences of the service interruption become unacceptable. The recovery point objective, or RPO, is the maximum amount of data allowed to be lost, measured in time. It refers to the age of the files or data in backup storage required to resume normal operations if a computer system or network failure occurs. If you have an RPO of 30 minutes, system backups must be performed every half hour to keep the data current. Failovers are designed to allow the system to seamlessly switch to a backup. This serves to reduce or eliminate the impact on users when a system fails. Redundancies are duplicate servers, attached to the network but ran offline. These allow the network to smoothly transition to the redundant server in the event of a main server outage due to traffic spikes, failure, or other issue. A redundant server can also help share the load on the main server to keep it from going down. Your organization’s disaster recovery plan (DRP) will determine how your organization will respond to any IT disaster scenario, with the goal of continually providing business services to users and supporting your sensitive processes and functions. Your DRP will address prevention and response – what you’ll do to prevent disasters from happening in the first place, and what you’ll do to respond if one happens. Your DRP is a key part of your company Business Continuity Planning (BCP). It will outline several disaster scenarios, define the detailed responses to each while aiming to keep impact to a minimum. In terms of prevention, the DRP will aim to minimize the effects of these scenarios, by outlining what your company has to do to avoid them. When building your DRP, ensure your failover policy is completely in line with your chosen synchronization method. If you’re maintaining a data center, maintain an off-site failover device to monitor your system health and reroute traffic in real-time, to another data center if your data center experiences failure. In the end, businesses are far safer implementing disaster recovery plans in their operations. It ensures synchronization of data and backups across distributed infrastructure to keep your business continually running smoothly in the event of hard drive failure, or any other number of IT disasters. The benefit of a investing either in infrastructure or a monthly subscription – in the case of SME-oriented cloud services – to protect yourself from disaster is definitely worth the investment compared to the potential loss of revenue and the damage to your reputation as a result of downtime or online security issues. You’d want to be prepared for disaster to strike in your personal life, so why not prepare for it to strike in the business world, as well?